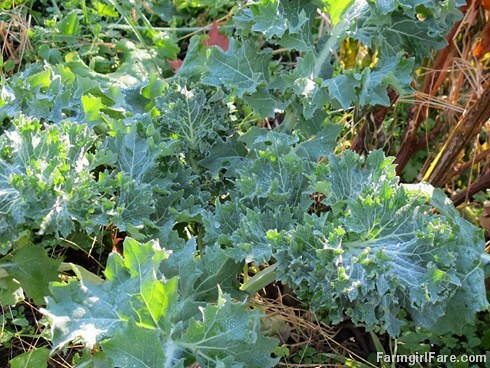 This volunteer dwarf Siberian kale plant doesn't mind the cold. Did you eat anything from your garden for Thanksgiving? I'm kind of embarrassed to admit the only thing I harvested was some fragrant lemon thyme that I stuffed inside a locally raised, pastured chicken (along with some of this year's garlic via the pantry), but it wasn't for lack of anything growing out there. It was more like we'd been enjoying freshly picked salads nearly every night for months, so we celebrated Thanksgiving by having things like champagne and grilled cheese sandwiches for lunch and apple streusel pie with ice cream for breakfast. But now the holiday weekend is over, and we're back on our usual veggie kick. It may be late November here in zone 5 Missouri, and we've already had quite a few nights down in the low 20s, but thanks to some floating row cover, old bedsheets, and a few plastic tarps, the kitchen garden is still supplying us with plenty of autumn bounty. —Salad Blend Siamese Dragon stir-fry mix and Rocky Top lettuce mix from Baker Creek Heirloom Seeds, direct seeded 9/20/12 over an entire bed (half and half), doing well but slightly frost bit from one night when it froze but was too rainy to cover anything. —Last few heads of Parris Island Cos and New Red Fire lettuce (they've already been trimmed to the base, I just didn't pull them out of the ground and they're coming back), direct seeded 8/28/12. Parris Island Cos is my new favorite lettuce. Beautiful, flavorful, and amazingly heat tolerant. —Purple kohlrabi (leaves gorgeous but no bulbs forming, a problem I've had before) and Blue Curled Scotch kale in the same bed as the lettuce, also direct seeded 8/28/12. —Dwarf Siberian kale in the same bed as above, direct seeded a few days earlier from seeds I'd saved from spring kale plants in an adjacent bed I let go to seed. —Mizuna, French Breakfast radishes, White Russian kale, Red Russian kale, Blue Curled Scotch kale, and Tuscan kale (also called Dinosaur kale and Cavalo Nero), direct seeded in one bed on 9/20/12, plus a few beet plants from spring that came back to life. Plants are much smaller than the greens seeded in late August, some are frost bit from having the cloth covers touching the frozen leaves on nights in the low 20s (am working on fixing that problem). —Half a bed of Swiss chard direct seeded back in early spring, ravaged by blister beetles in summer, and looking gorgeous again. Swiss chard is more versatile than spinach, heat tolerant, cold tolerant, and easy to grow from seed). I mixed up a bunch of open packets of different varieties and scattered them across the bed: Charlotte, Orange Fantasia, Pink Lipstick, Sea Foam, and Vulcan (a slightly boring but always dependable giant green variety of Swiss chard that insects seem to bother less than the others). Also in that bed is a giant Tuscan kale plant from last fall. Instead of pulling up the whole plant, I simply harvest the leaves and they just keep growing back on a longer and thicker stalk. It's about four feet tall now. —Chives, parsley (six pack of seedling purchased last spring), lavender, and lemon thyme (which is spreading nicely) all still doing well. Chives and parsley are covered each night; lavender and lemon thyme are not. —My late green bean planting experiment (Slenderette and Masai in the PVC mini greenhouse bed on 8/23/12) froze to death despite being covered with both sheets and heavy clear plastic, but the row of Crosby Egyptian beets next to them is doing well. —Lots of volunteer Swiss chard, lots of lemon balm (it's sort of taking over in there, and I should probably do something about it), a couple of chive plants I transplanted back in the spring that haven't really taken off yet, and my trusty pot of Greek oregano. —The English thyme has died back, the parsley has been eaten by something, and my late cucumber planting experiment (four miniature white cucumber plants that sprouted from direct seeding on 8/28/12) was doing great until some creature ate all the plants down to nothing one night. So what's going on in your garden these days? © FarmgirlFare.com, where we've had cold rain all day, our coldest night yet predicted tonight, and a chance of snow, so who knows what will be left out there by tomorrow. Hi Susan. You've got way more going on in your garden than I do in mine. I do have a few lettuce plants left, Red Sails and a romaine, some parsley, celery (something I've not tried before), and a few sad basil plants that I really should pull out. I planted my garlic in late October and they are already four inches tall. I was able to leave my Raven zucchini plants in the ground until about a week ago and picked the last of the fruits before pulling the plants out. Mostly what I've been doing, when it's not pouring down rain, is digging in compost and putting down rice straw so the rain doesn't compact the soil for spring planting. I have some six packs of onions to plant and just today bought some kale starts (red, white, and cavalo nero) , so I will have some greens to harvest in a month or so. I put them under row covers and they do fine in our not-too-cold winters. Let's see, what else? Believe it or not but cilantro grows throughout our winters and I've got several volunteers up right now. And the rhubarb plant just won't quit this year: I've been making rhubarb sauce for topping ice cream and also to serve along side pork chops. Thanks for the opportunity to share! I got my garlic planted a week ago so that was my last true garden chore. I have one huge perennial chard plant that just refuses to die.. its a thick hunk of a root about 1 1/2 feet wide & as tall. Chard is growing nicely all over it & is still going strong. It went to seed this past spring and its reseeded itself all over that little area.. should have loads of it next spring volunteer. The Gardeners Delight cherry tomato I planted there once a few years ago volunteers in a huge way there too. My cilantro is still going strong, my thyme, sage, lavender, and terigon are still hanging in there. I put my Chicago Hardy Fig to bed this week and hopefully it'll make it thru our Cleveland winters. Greetings from Kansas city. What a bevy of varieties and all in raised beds. Am very jealous. Among is French Breakfast back in Sydney at around 8 before I moved to Kansas in 1978. Also few people grow purpled topped kohlrabi and that's a pity. Enjoy the fruits of your labor, buddy. Eh...we smoked the turkey in the garden - does that count? Since we were only responsible for bringing the turkey to Thanksgiving, we didn't eat anything from our garden, but we definitely ate stuff from my mom's garden. Though, I doubt the multiple slices of pumpkin pie (which made up the majority of my dinner) came from her garden or Mrs. Smith's. I'm now considering growing pie pumpkins again next year so that I don't have to suffer the cruelty of people's lazy storebought pumpkin pies. Not much. Definitely not enough leeks this year, though. Leeks are pretty much the best part of winter. Next year we're planting a lot more leeks, for sure. I'm seeing this a month late, but here in southern Virginia (zone 7) we've still got quite a few things still hanging in there. We have collards, broccoli, cabbage, bok choy, radicchio, swiss chard, turnip greens and kale. Just finished off the last of the brussels sprouts.